For this piece I used pastel on black paper. I wanted to look at the structures of the plants which I find fascinating. I love the fleshiness of succulents and the orchid’s odd roots. 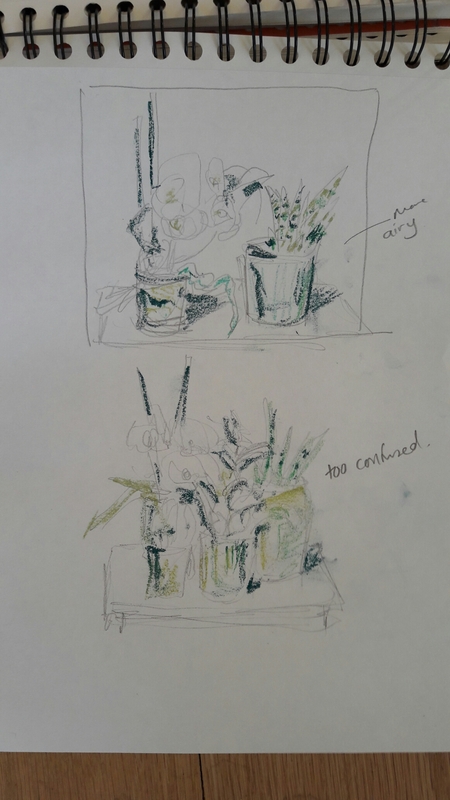 I wanted to create a relationship between the two plants so looked at composition in my sketchbook. I also explored the use of shades of green in my sketchbook. I put the plants on a bread bin to create a plinth. I found it a challenge to reflect changes of tone using different coloured pastels but I am pleased with the result. I like the space between the plants which I think creates a relationship between them. 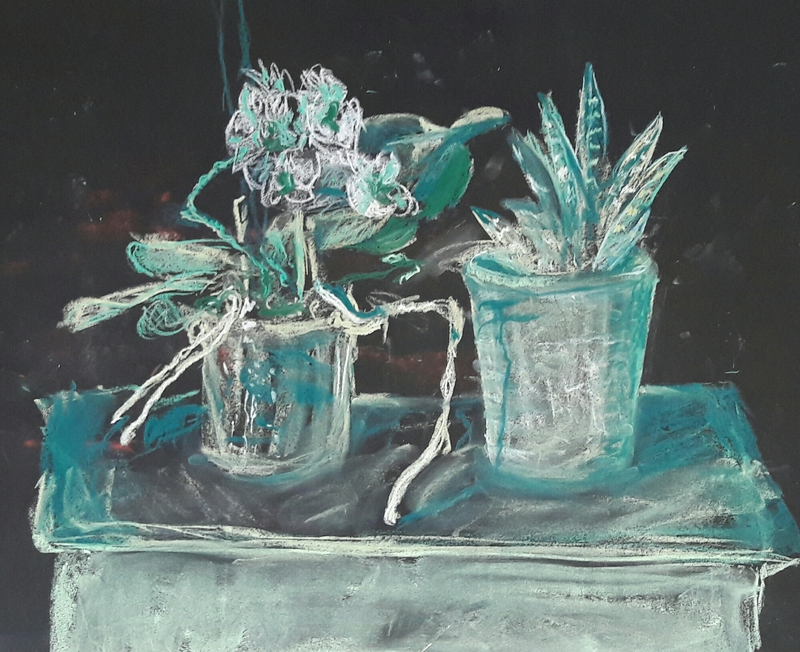 The slightly ghostly pastels create an otherworldly, odd look to the plants which reflects how odd and mysterious I find them. There was a real temptation to use pink on the orchid’s inner sepals which are really pink. I decided to stick with the monochrome but will explore this in another drawing. The drawing is a bit rough. While the sketchiness gives it an energy, it looks a bit unfinished. I didn’t want to keep working on it in case I overworked it but this may also be something to look at in a future drawing. The background already had a bit of red pastel on it which had rubbed off from another drawing. I left it and added some crumbling of white and green pastel. While leaving the red on the background in place might be “cheating” in a monochrome it gives an interesting compliment to the green and livens up the background too.